Frankly speaking, Irish Luck slot has no disadvantages. Instead, it boasts a nice design and high-paying symbols, and offers some free spins to the luckiest gamblers. And its jackpot is kind of attractive! Irish Luck slot was developed by Playtech. The game has 5 reels and 30 paylines, and its design is bright and eye-catching. The paytable is really pleasant to look at, especially if you are lucky enough to meet that cute red-haired girl. By the way, she is the wild symbol. And the pot of gold is the Scatter. Okay, let’s talk a bit more about that girl. 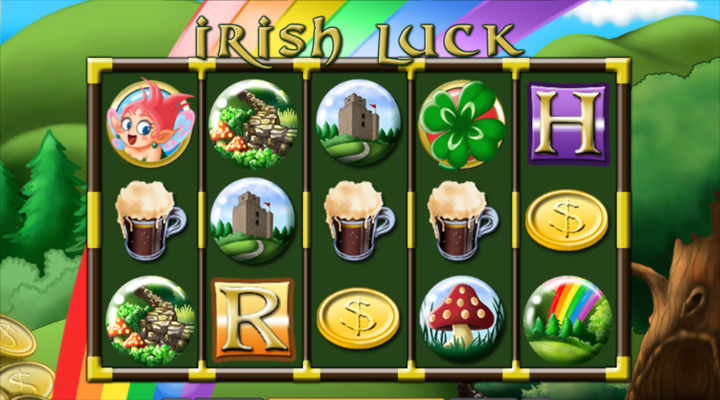 So, the wild symbol of Irish Luck slot can substitute for any other symbol except the pot full of gold. This girl is stacked, and she can bring you a really cool payout. Just take a look at the following sums: 10 for two wild symbols in a line, 250 for three, 2500 for four and 10000 for five. Sounds nice, right? Apart from this, this girl doubles any other winning in which she takes part. You see, she is not only beautiful, but also useful. But the Scatter has a nice feature which the Wild is not able to offer - it can initiate the bonus round. So, if you manage to collect three or more Scatters anywhere on the screen, you will see a leprechaun (a normal one, not that creepy creature from an old-school horror movie) pushing the pots of gold right across the center of the paytable. You start with x2 multiplier and 8 free spins. Then you will have to choose 2 pots of gold out of 5, so you can get more multipliers and spins. And, by the way, the scatter symbols can trigger the bonus again even when you are using your free spins. After you hit a win, feel free to gamble and, probably, to double your balance. The only thing you have to do is to choose the right card. If you are lucky, your payout will be doubled. And don’t forget about the limit to the doubling - it is 1500 credits. Irish Luck slot is a pretty nice game to try. It’s stylish, entertaining and kind of promising! Yeah, you can win the 10000 jackpot here. Wanna try your luck? Yes? Then click this link.